So, you have a theme night, but you don't have hair, and often, that lack of hair can make or break your outfit! If you're going for the Zombie look at Halloween, your shiny cranium will be an asset, but if it's Disney Princess, you're probably going to need a wig! 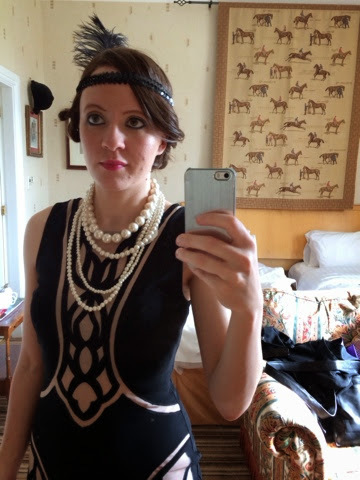 Last year, I went to a 1920s inspired Awards night, and I started to panic about what to wear! I had to look modest because it was a client event, but I also wanted to look classy and sophisticated; just what the 1920s is famous for! The 1920s was marked as an era of post war change, the start of a more liberated society and for many ladies, a time of short bobs, pin curls, dark lips and a touch of rouge. Skirts got shorter, frillier, and covered in beads, while hair was flirtatious yet tightly controlled. 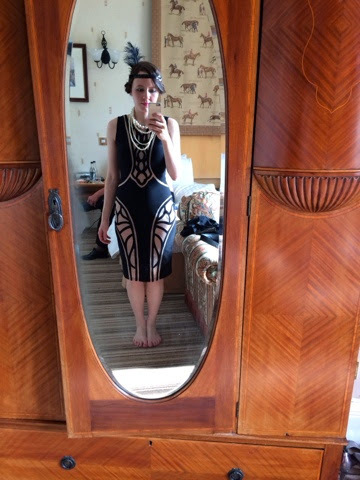 I nailed the dress with a purchase from Debenhams - a flapper dress isn't appropriate for a work do, so instead I opted for a monochrome number which uses art deco shapes to evoke the 1920s style. Not 100% perfect, but I was pretty happy with it! Then, on to the (obviously) more important bit... The hair - how to recreate a 1920s inspired style with a wig - unless you've invested in a human hair wig, this is not necessarily an easy task. For this one, I selected the Haute wig by Jon Renau; it's one of their Smartlace Heat Defiant range, designed to be styled, heated and moulded to suit your mood; or worn as it comes - a chin length bob with lots of sophistication. I selected it for its medium length - not too much to work with because the 1920s is famous for short crop bobs, but long enough to enable me to style it and hide the edges at the nape. It might sound obvious, but first thing to do is brush through the hair, add any leave in conditioning spray and make sure all the fibres are separated and loose. This will be important for the actual styling. Separate one third of the hair and tie it up out of the way. If you have a fringe, choose the opposite side to the way it sweeps; if you have a centre parting, pick whichever side you prefer. Leave the first section free; in this case the fringe - you'll come back to it later. Pick up the beginning of the next section about one inch thick. Start to twist, keeping it tight enough to hold its shape, but loose enough not to create a false hairline. This is important so that you don't make it obvious you are wearing a wig, but how tight you pull it will depend on your individual wig. Twist it towards the back of the head. As you twist, gather up more and more pieces of hair, bringing them into the twist. Do this until you reach the end of the hair. When you reach the end of the length of hair, twist it into a bun and attach it with kirby grips to the nape of the neck. It should be at least halfway around the wig / head so that the style is mostly on one side of the head. Take another piece of hair about two inches thick, twist it gently and create another bun; fix it with kirby grips next to the first. Split the remaining hair in two, leaving a small amount by the face; mine was about one inch thick. Twist the remaining piece to the bottom, curl the end round and pin in a loose bun next to the other two; preferably slightly higher as long as it doesn't expose the wig band. Take the final exposed bit at the front of the face, twist it loosely and wrap it into a tiny pin curl. This is where you wind the curl around inside itself to create a visible, decorative spiral. It's harder to do in a synthetic wig because the fibres are much stiffer, but it'll still make a lovely decorative piece. Mine ended in a figure of eight shape, which wasn't so historically accurate, but still looked pretty. Return to the first side and the piece of fringe that you left; take the end and tuck it behind the original twist, creating a loose, sweeping fringe. Add a headband, an outfit, some darker shadowing around the eyes and a slash of deep red lipstick and you're done! I hope you've found this one useful and if you've used it, we'd love to see some pictures! One more point before I go... I wear a slightly less complex version of this to work - it looks fab! Also, the great news is I've been invited to a "Roaring 20s" ball later this year, so learning this style will come in handy once again!